I have a confession. I have always been put off by one thing: faces in Bethesda games. But that may change. 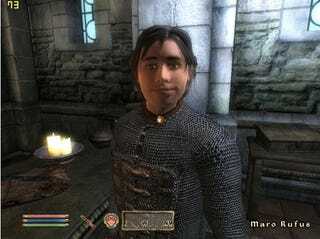 Take Oblivion, the faces in that game actually freaked me out! I wanted to get into the game, explore the world, but I found myself getting hung up on the way the characters look. Those stretched Cheshire Cat putty faces. Perhaps it was too close to Uncanny Valley territory? Or perhaps it too far from it? Perhaps it was just me? Fallout, with its stylized take on post-apocalyptic Americana, was an easier pill to swallow. (No, it was a delicious pill to swallow!) Wonderful world to get lost in, impressive game but those faces remain! Argh! Bethesda's upcoming first-person shooter Brink looks jet set to rectify that issue. Okay, this isn't entirely fair. The game, which I checked out at E3, isn't developed by Bethesda, but UK developer Splash Damage. Bethesda is publishing the game, so fingers crossed, maybe some of this title will rub off on future in-house Bethesda games? Brink offers varied customization: Hair, face times, scars, tattoos, body types, clothes, etc. Players toggle through, find what they like and create their new character. And there is a color wheel so that players can find the hue or shade that fits their character best. Other titles Bethesda has released in the past do this, too! The body types are used for character classes — so a big guy would use big weapons, move slower and take more damage. Check out this video from earlier this year. The interface for the customizer I saw at E3 was slightly different — the background was white, for example. Players could toggle through different points on their character to change it. After selecting the customized feature they wanted, it was possible to access various colors. Brink's art style has really got me — more than I thought it would. It's somewhere between "real" and "Team Fortress", which I think is a really, really good place to be.